The flavor and texture of an egg is subtly different when baked en cocotte in a small deep dish such as a ramekin, rather than flat as in oeufs au plat. When served, the egg white should just be set and the yolk soft. When seasoning, sprinkle the salt and pepper into the ramekin before you drop in the egg, not after, or its surface will be spotty. Baked eggs can be served plain but are usually picked up with a little garnish. Fresh herbs are a light, colorful touch; a slice of foie gras or truffle shavings add a whiff of luxury; and a spoonful of ham, bacon or other typical omelet fillings are simple, savory additions. A tablespoonful of cream on top keeps the egg moist. Serve the egg in the ramekin, set on a napkin or doily on a small plate, to eat with a teaspoon. 1. Make the garnish: Heat the oven to 350°F/180°C and butter the ramekins. Heat the butter in a small frying pan and fry the scallions over medium heat, stirring often, until golden brown, 5 to 7 minutes. Season with salt and pepper and spread them in the ramekins. Fry the croutons in the butter until brown, stirring often, 1 to 2 minutes. Scatter them on the scallions with a bit more salt and pepper. This garnish can be prepared 3 to 4 hours ahead and kept at room temperature. 2. 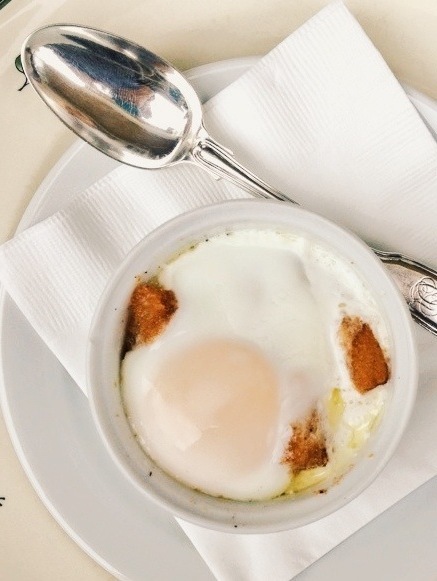 Bake the eggs: Break an egg into each ramekin and add a spoonful of cream. Set the ramekins in a roasting pan lined with a dish towel, and pour boiling water half way up the sides to make a water bath. Bring the water to a boil on top of the stove and put the pan in the oven. Bake the eggs until the whites are almost set, 10 to 11 minutes depending on the thickness of the ramekins. The eggs will continue cooking a minute or two in the hot dishes when you take them from the oven. Simply Potatoes would make my fall meal planning easeir or shall I say SIMPLER! (ya, I know, I’m sooooo clever) anyway I’m all about SIMPLE and YUMMY. Now, random.org, pick me pick me!! !